Referencing may be your last thought when you are conducting a research assignment (or ERA in psych) but it should really be your first.This is because, from the very first searches that you do in your assignment to the quotes that support your arguements, you should be acknowledging the source of your information. From a more self-serving point of view, referencing is usually built into marking rubrics from Year 10 onwards so there are marks that are there for the taking. Good referencing, like correct spelling, is the cornerstone of good work. You also don’t have to worry about whether your teacher will ‘like’ your referencing because, like spelling, you either get it right or wrong. So get it right. Alright then, how do I do it? Your teachers will tell you the type of referencing they want you to use. This depends on the standard for the topic that you are taking. If they haven’t told you which one to use, ask. To get the specifics of the particular styles, skip ahead in this post to the section called, ‘What are these styles of which you speak?’. To go straight to the guides on how to use some of the main styles, click here. When conducting your initial searches, take notes as to where your information came from. You will need to know the author, editor (if there is one), year of publication, title, edition, publisher and the place of publication. There are different requirements for newspapers, journals and websites so make sure you find out the referencing style beforehand and take note of the required information while you are doing your research. If you are mainly conducting your research on the web, use an online bookmarking site like Delicious or Pinterest to keep track of the websites you visit. When you use a quote or refer to an idea in your essay you will usually need to reference it in the text and include it in your bibliography. On the other hand, if you have used someone else’s work to get background information on your subject, it will need to be acknowledged in the bibliography at the end (this also shows the teacher how hard you worked to research your assignment so make sure that it is impressive). Once again, the format of this depends on the referencing style that you are using so make sure you know which one to follow. Acknowledging quotes and ideas in your assignment will either be done using an in text citation if you are using the Harvard style or in a footnote if you are using the Oxford referencing style. In text references (Harvard) will need the last name, date and a page number. To use an author’s ideas, just put his or her name and the date then explain the idea in your own words, for example, ‘Cox (1996) suggests that…’. When you are quoting the author, include the page number and then the quote in quotation marks, ‘Cox (1996, p.17) writes “Camels are…well suited to the hot dry (desert) climate”,..’. Make sure that you only quote the information that is relevant and use ellipses for omissions (…) and parentheses for your own additions (()). Footnotes (Oxford) involve a number in the text in supertext (ctrl+equals). That relates to a footnote at the bottom of the page that includes the author (first name first, eg. T. Flannery), editor, year of publication, title, edition, publisher and the place of publication. The exact information you need and the order that this should be in depends on the type of source that it is (book, encyclopedia, website, etc.). Your bibliography then includes all of the details of the sources that you quoted as well as any other sources that you used to create your piece. This is where you create a list, organised alphabetically, that includes the author (last name first this time, eg. Flannery, T), editor, year of publication, title, edition, publisher and the place of publication. Once again, the order of this information depends on the type of source and the style of referencing you are using. What are these styles of which you speak? Some subjects prefer you to use the American Psychiatric Association‘s referencing style (APA), others will prefer the Harvard or Oxford styles. 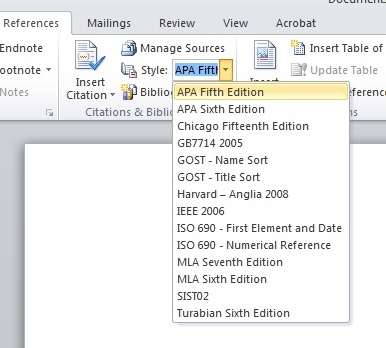 MS Word has a button on the Referencing tab that will generate citations for you in a range of styles (pictured below). Other style guide are available free online, like these provided by Victoria University, which will tell you how to format your references in the relevant style. I don’t really want to do any work, can someone do it for me? Yes. As you can see above, MS Word has a button that will generate citations for you. Just select the style that you are using and a window will pop up with a form. 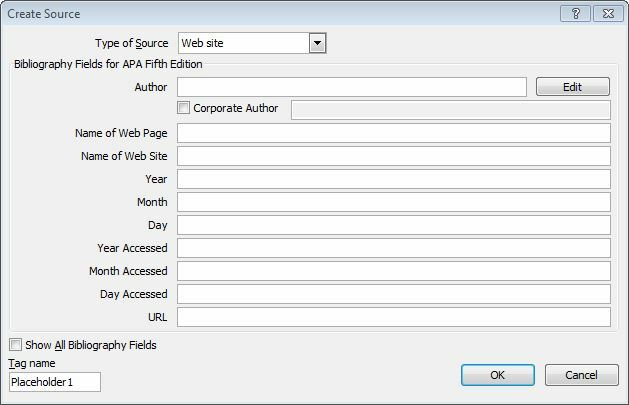 Fill out the form and it will format that information into a perfectly formatted citation for you. Plagiarism is the best way to get no marks for an assignment that you have worked moderately hard on. Zero. If you put in just a little bit more effort and reference your sources properly you will end up with excellent marks. Moderate effort and no marks or a little bit more effort and great marks, I know what I’d be doing. Having trouble referencing? Come and see us. It’s your library.